The Micro finance Institution chooses the choice that best suits their operations. LTS generates a repayment schedule clearly showing a repayment time table for the loan. Customers would know when their stipulated installments are due for repayment so as to avoid un necessary penalties on loan defaults. For cases of monthly interest rates, the system computes interest on loan based on outstanding balance, at the end of every customer’s month, depending on when the loan was disbursed. Information recorded into the system settles in a temporary file , for error correction, pending posting at the end of the business day. The system has an internal mechanism to check for errors in data entry. At any time the error checking wizard can be invoked and will report any errors found , the transactions and users responsible. The System enforces financial accountability for each cashier, who keeps receiving and giving out money. At the end of the business day the system will show any money held by each cashier and would balance this off against physical cash a cashier hands over to treasury. At the end of the business day, after every cashier has balanced, data is posted to permanent storage structures. This is done through the Posting option. Creation of user accounts, setting up parameters for interest computation on savings accounts, and stating minimum balances. 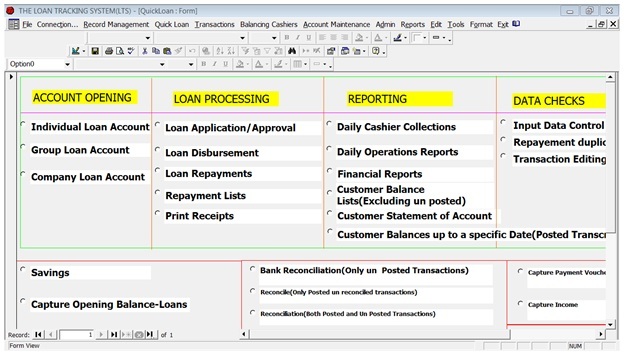 Creation and modification of the chart of accounts. LTS is rich in reporting. The Report form and the data sheet form. The report form is a preformatted format and can’t be changed, yet the data sheet form is an Ms-Excel format enabling users to manipulate data in any way they want eg sorting, filtering, summing up values etc. LTS is a fully fledged accounting package. It enables us to record all accounting information. You can record all forms of income, expenses and loans received from banks. You can also pass journal entries.